Goal: Participants shall understand and demonstrate effective clinical radiographic skills and film management that will protect the patient, the operator, and produce quality films for dental diagnosis and treatment. Didactic: A pre course study period of 9 weeks will be assigned, which includes the purchase and use of the Textbook: “Dental Radiography Principles and Techniques” 5th Edition, 2016, ordering details, page 2. Textbook quizzes will be emailed to the instructors for grading. Students will have access to instructors via email for assignments and questions. 1. Identify X-ray machine components, settings, and activation switches which protect the patient and produce quality films. 2. Demonstrate equipment identification and film holder assembly. 8. Demonstrate proper labeling of a panorex and duplicate films. 9. Demonstrate proper documentation of radiographic exposures. 7. Radiographic techniques for the Full Mouth Series (FMX) and FMX patient management techniques and trouble shooting. We will order the book and have it shipped to your home address. PROGRAM COST: $825.00 which includes the book shipped to your address. Management and Human Resource/Business Management Development firm. 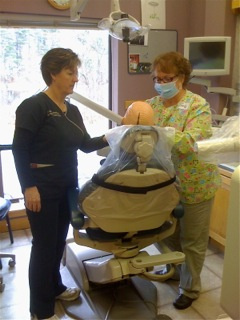 Kayla Sikora, CDA, BS, MS, Instructor , is a graduate of the University of Southern Maine and has several years experience as an instructor and CDA in the dental field. She is currently the owner of Sikora and Associates, an educational corporation for dental assistants, a current instructor for the Helping Hands Dental Assisting Program and Turbyne & Associates Radiographer Program. Betsy Holt, COA, is a Certified Orthodontic Assistant with 25 years in the field of dentistry, 15 ofthose as a Treatment Coordinator in an Orthodontice Practice. Her clinical, communication, andadministrative skills facilitate the Radiographer Program. Turbyne & Associates is designated as a approved PACE Program Provider by the Academy of General Dentistry (AGD). The formal continuing education program of this Provider are accepted by AGD for fellowship, Mastership, and member maintainence credit. Approval does not imply acceptance by state or provencial boards of dentistry. The current term of approval extends from January 1, 2015 to May 31, 2019. "DANB is a registered trademark of the Dental Assisting National Board, Inc. (DANB). *This course is not reviewed or endorsed by DANB." To Register: Please send this form and a check payable to Turbyne & Associates: P.O. Box 738, Auburn, ME 04210-0738, or REGISTER ON-LINE!